The current work-in-progress: An audio-visual installation called Silent Temples, on which I am collaborating with my colleague and friend, an audio engeneer and artist, Vilius Jokubaitis. Together we are working to fuse the magic of ancient Baltic signs and symbols with 5.1 surround sound and animated photomontages. An installation comprising 90 minute projected film and 5.1 surround soundtrack is planned to premiere in Klaipėda, Lithuania, in summer 2020. In 2012 I worked on an installation called “Be-tono” (“toneless”) for the audio-visual poetry festival Tarp 2012 in Vilnius, Lithuania. 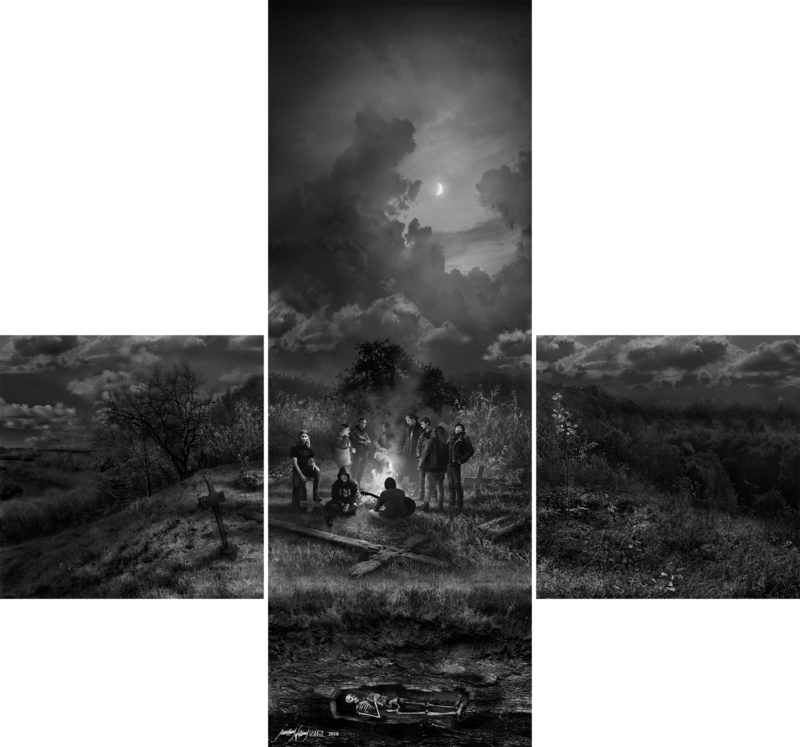 I contributed a large scale photomontage called Altar Shadows, which was inspired by life and work of an early 20th century Lithuanian writer and poet Vincas Mykolaitis-Putinas. The festival then invited a number of contemporary poets to write their poetic interpretations of the image, which were then put onto grey silicate bricks and arranged on the floor. Installation was shown at the Vartai gallery, Vilnius and then travelled to Klaipėda, Lithuania, where it appeared at the I.Simonaitytė’s library. 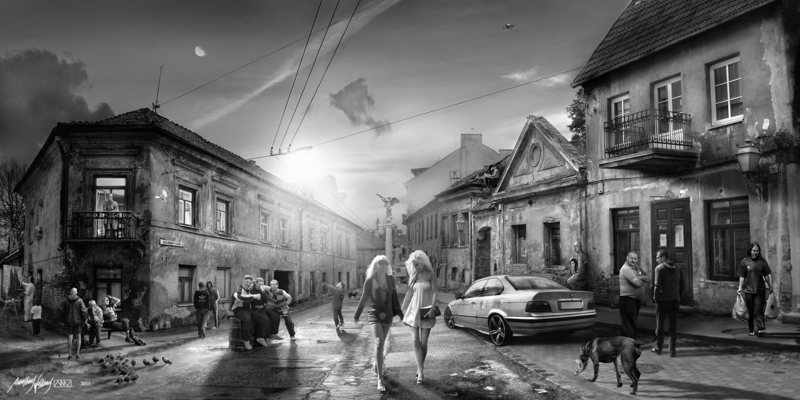 Requiem for a Post-Soviet Dream is the first series of photomontages I ever made. Images embody the most vivid memories, dreams, visions and hopes related to the post-soviet reality, as seen by a growing child, as well as the difficulty of the human condition in general. It tells a story of a little boy growing up in the post-soviet world. The first publication of the series was in 2010, when it participated in a contest for young photographers called ‘Debut’ and came third. The competition was organized by the Union of Lithuanian Art Photographers. 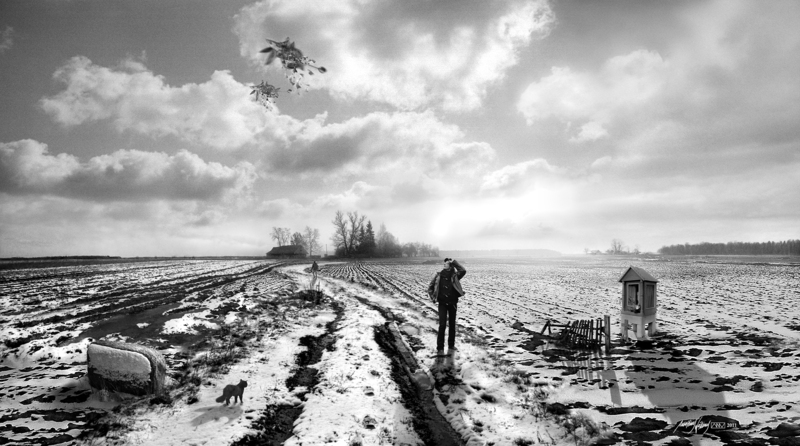 Three prints were shown in the exhibition of 11 finalists which took place in Vilnius in November 2010. In July 2011 eleven prints were shown in Vilnius in a solo exhibition entitled ‘Photomontages’. The first exhibition with the ‘Requiem for a Post-Soviet Dream’ title took place in Sheffield, UK in March 2012. In May 2012 four prints from the series were shown in the Woolgather Art Prize exhibition in Leeds, UK and came second. Between 2012 and 2014 the series toured exhibition spaces in Lithuania and was shown 9 times.